Rolling drip tape on shuttles for storage and reuse. It’s been raining all day, so I look around for inspiration and useful rainy day work. Repairing things and making useful tools are usually satisfying.And I found a couple of fun and inspiring inventions by others to share. Gather spring clamps (4 per cart), rebar axles, carts, small bucket for end caps, black marker, yellow or white grease pencil (in Drip Tape First Aid Kit), a few pieces of rope 2-4 ft long. Disconnect drip tape at main pipe, by unscrewing the connector from the tape, not by pulling the connectors out of pipe. Don’t disconnect any short drip tape blank ends, leave them in the pipe. One person coils the mainline pipe in big 4-5 ft diameter loops, with NO kinks. Tie in three places with rope. Make and affix a plastic label if there is not already one attached. Describe what crop it was used for, and what row spacings, number of rows. Store. Meanwhile, other people free up the drip tape without destroying the crop too much, and write the length on the ends, using the grease pencil. Then roll it on appropriately labeled shuttles, two lengths at a time, tightly and tidily, each keeping to cos own side of the shuttle (so they can be unwound separately). Tuck last end in, and ensure the end of the drip tape is labeled with the length, and both sides of the shuttle are labeled. Take all the shuttles to the barn, and hang them in pairs over the beams using rope. Use knots that a normal human will be able to undo easily. Hang shuttles high enough so people won’t bang their heads, but low enough to be reachable by someone standing on a chair. Return all the tools and supplies. 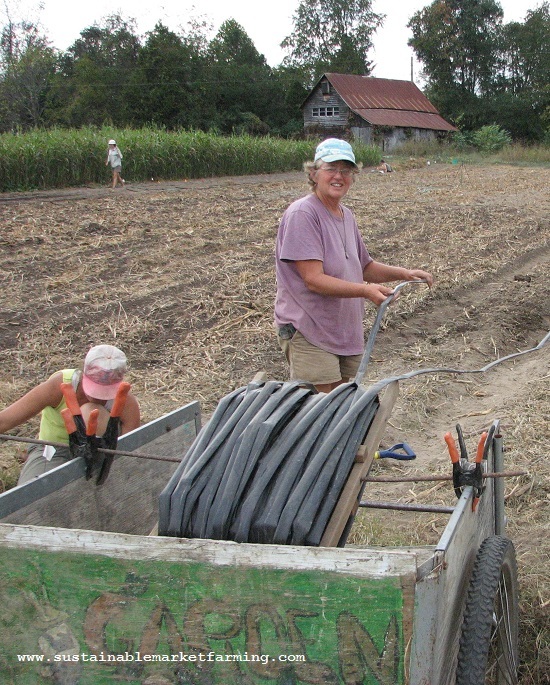 Unrolling drip tape from shuttles, using a garden cart as support. Rowcover rolling with crank handle. The row cover reel is our favorite part of our system, and it is super low-tech. It is comprised of two portable saw horses with pipe straps attached and a PVC crank we made to fit on the end of the row cover pipe. We set up the saw horses at the end of the bed about eight feet apart. We then push the PVC pipe through the pipe straps on each saw horse and hammer our crank onto the end of the pipe with a rubber mallet. By using long pipes to roll the row cover on, they have handles to hold, and a space to label length, width, condition of the row cover. 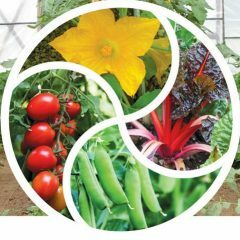 I learned from the Small Farm Central blog that Harvie connects customers directly with local farms who deliver shares of farm fresh produce customized to meet personal preferences. Like a CSA, but with choices. 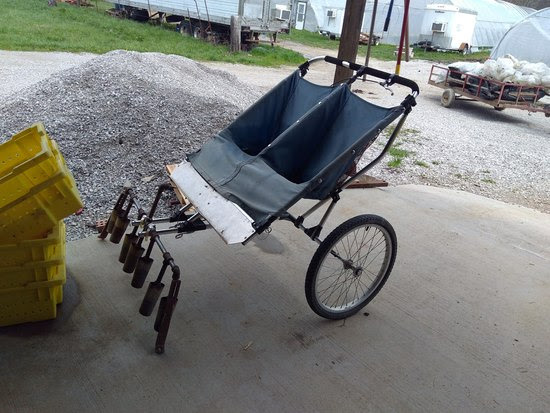 Repurposed stroller makes a fine flame weeder. and the inventive farmers Ford and Amanda are from Sustainable Harvest Farm in Kentucky. I’ve written before about the wonders of flame weeding. We bought our Red Dragon backpack flame weeder from Fedco. We’re going to need the stroller! Single-torch flamer saves lots of weeding time. 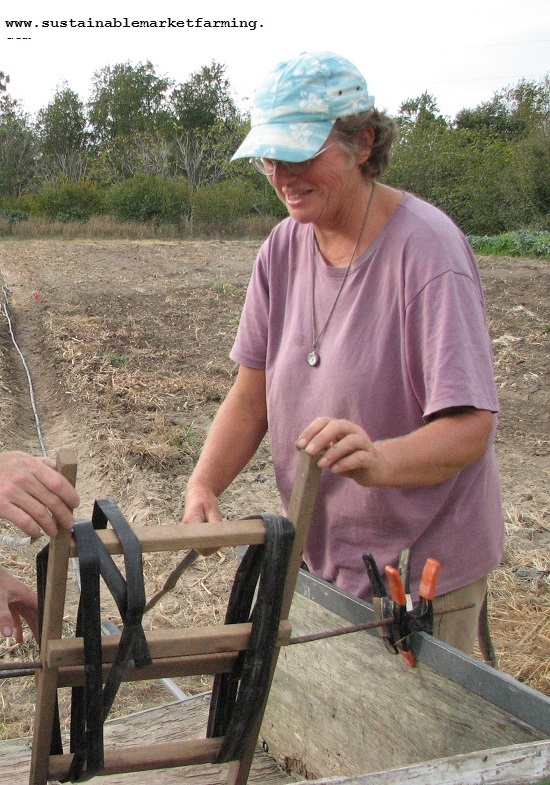 Another tool we love is our all-steel broadfork from Way Cool Tools. 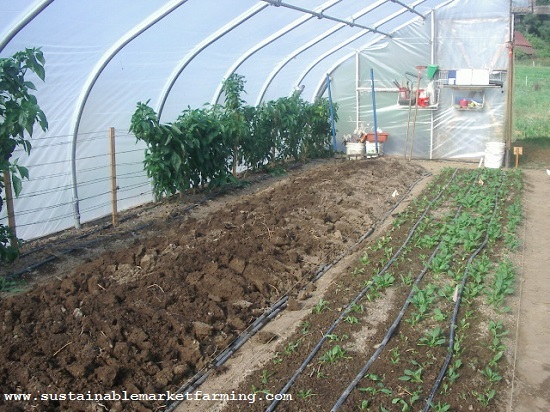 I wrote about it last September, when we were preparing our hoophouse beds for winter crops. This tool is great for aerating compacted soil without inverting it. The soil beasties thank us. Below is a photo of a hoophouse bed after broadforking before the (immediately following) task of raking to break up the big clumps and produce a fine tilth. It’s important not to let the soil dry out into bricks before raking, or life will be hard (and those soil beasties may be dead). Lastly I’ll mention our blueberry hoop method. Maybe your bushes, like ours, are flowering now, and maybe you are determined to have a better netting system than you had last year. I described our (then new) blueberry hoop system in 2013. The blueberry area is 16′ x 65′ approx. Height of the netting supports needs to be 7′ or more for most of the space. The 20 blueberry bushes are 66″ apart, in two rows. We chose PVC Electrical conduit to make our hoops. Unlike PVC water pipe, plastic electrical conduit is UV-inhibited for outdoor use. Lengths have flanged (bell) ends, and can be joined without any connector pieces. It’s lightweight, and no bending tools are needed (unlike for metal conduit or fencing top-rail). It packs flat for out-of-season storage, and is relatively cheap. We made a “Spider-House” temporary framework: An idea used for temporary “field houses”. It consists of pairs of bows fastened together at the apex, in a way that spreads out into a 4-legged structure. A row of these make up the frame. An advantage is that the spiders are stronger than simple bows, and that the whole thing can be dismantled relatively easily. The shape helps add strength to lightweight bows. 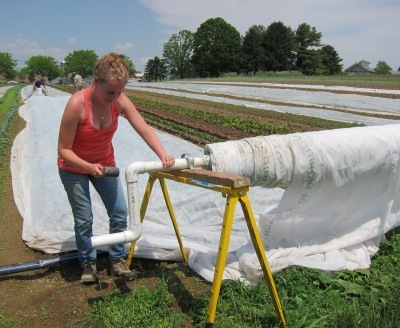 We use drip tape with emitters every 8″ (sandy clay loam soil). We buy the low-flow rating type, so we can run long systems at once, for two hours at a time. And we buy the thickest plastic because we don’t much like using plastics and we want to make them last as long as possible. I hear you saying that thicker doesn’t last longer than thinner for you because it gets chewed (by rodents?). Can you deal with the rodents any other way? Dogs, cats, traps? Do you know what kind of rodents you have?